I come from a background of fine art and interactive design, which allowed me to satisfy both the right and left sides of my brain. When I fell into graphic design, I started to struggle with whether it was a form of art and vice versa. I didn’t know which side of my brain to use. That is, until I met hand lettering through Jessica Hische. I identify with Jessica Hische in many ways. One of my favorite quotes from her is “The work you do while you procrastinate is probably the work you should be doing for the rest of your life.” I, like Jessica, found myself “procrastiworking”* on fine art projects during school, so it makes sense that I have also fallen in love with hand lettering. 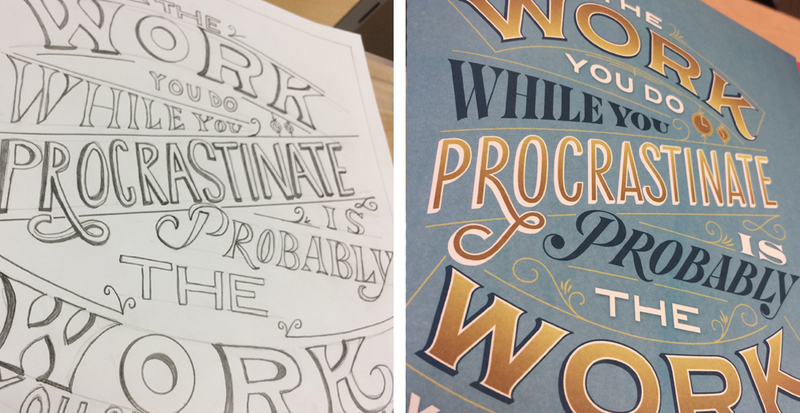 A GREAT WAY TO LEARN HAND LETTERING IS TO PRACTICE BY COPYING THE WORK OF EXPERTS. HERE IS MY PRACTICE PIECE BESIDE HISCHE’S FINISHED WORK FROM HER BOOK “IN PROGRESS”. At Fifth Letter, each staff member creates “90 day goals” for themselves. This should be a common practice for creative agencies, as it gives employees a chance to advance their current skills, learn new skills, and keep up with current trends and technology. One of my first 90 day goals was to further define the differences between art and design. I thought I had it figured out despite the huge overlap between the two, until Elliot started asking me about hand letterers. Were they art or design? I would argue both, which is why it fits into my skill set..
Everyone wants to find a niche in their career field. For designers, it could be user experience, user interaction, graphics, animation, data visualization,…or hand lettering. I’m not calling myself a hand letterer by any means, but I have discovered a passion for it. I’ve found myself doodling hand lettered words whenever I have a chance. Beginning with sketches and ending with a computer-rendered piece or an entirely hand made piece is so satisfying. Hand lettering is precise. It’s freeform. It’s type. It’s shapes and flourishes. It’s the perfect combination and juxtaposition of design and art elements.. So, a huge thank you to Elliot for allowing me to indulge in hand lettering. I hope every boss provides opportunities for their employees to work on what they’re passionate about..
Lyn Fonzi, Pace Setter at Fifth Letter, is constantly breaking in new running shoes and new ideas. 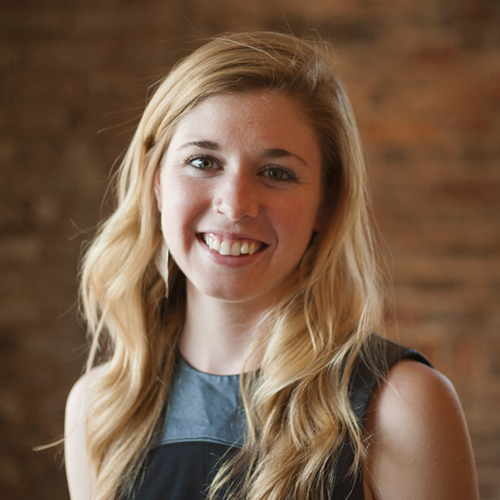 She received her Master’s degree in Interactive Media and specializes in web design. Lyn can be found around downtown Winston–Salem running with her two dogs.